I jumped on the gluten-free bandwagon a while back, and while I didn’t see much…or actually ANY noticeable difference in the immediate quality of my life, I am still willing to concede that the wheat flour we eat ain’t what it used to be. Everything you read about the condition of our grains is appalling. 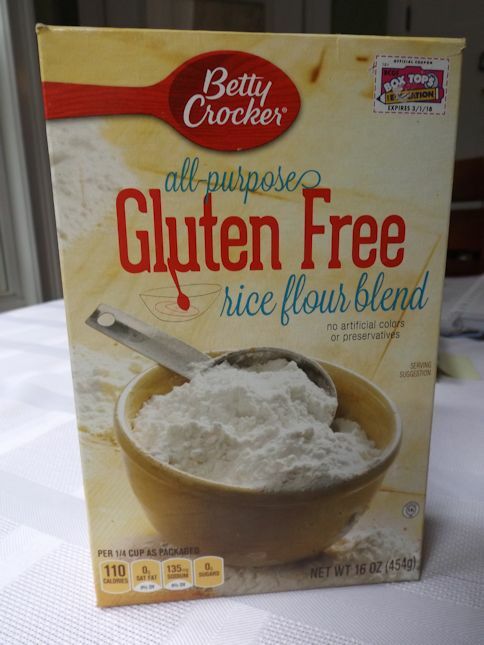 I’m not completely gluten-free any more but I have incorporated different types of flours into my diet on occasion. I wish I could say that this breakfast cobbler is some lofty example of my heightened awareness of nutrition. 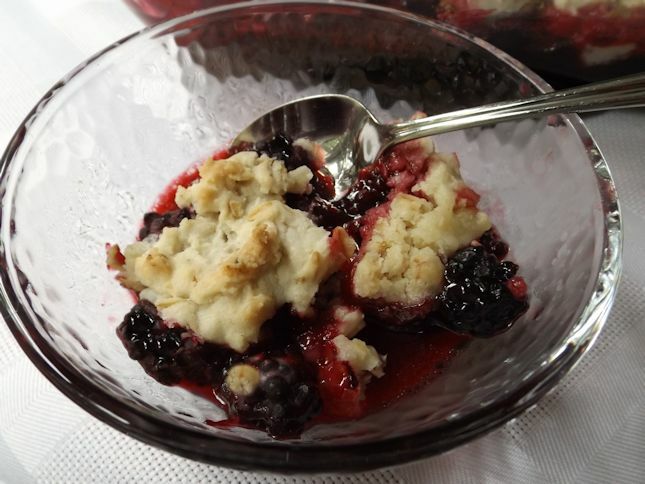 Although the berries are organic and the flours are wheat-free, I was mostly just trying to use up last year’s blackberries in my freezer and the get rid of the half-used box of rice flour mix in my pantry. People talk about being a “purposeful” eater, so this probably isn’t a very good example of that concept other than the main “purpose” was to clean out my freezer and pantry. Does that count? Preheat oven to 350 degrees. Place thickened fruit in a 9X11 glass dish. (I thickened my fruit with a little more flour, sugar and pats of butter.) In a small bowl, mix the butter and sugar and cinnamon (if desired). Add the egg and vanilla; mix by hand until thoroughly blended. Stir in the rolled oats and flour. Dab mixture on top of fruit. 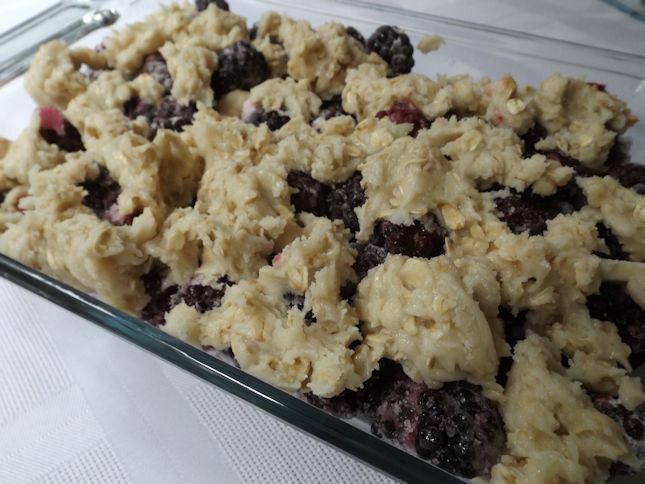 Bake approximately one hour or until topping is set and fruit is bubbly all the way to the center. Here is the flour blend I used. I have tried several and this gives smoother results than some of the other ones I’ve baked with previously. Here is the coverage I got on a 9 X 11 pan of fruit with the topping. 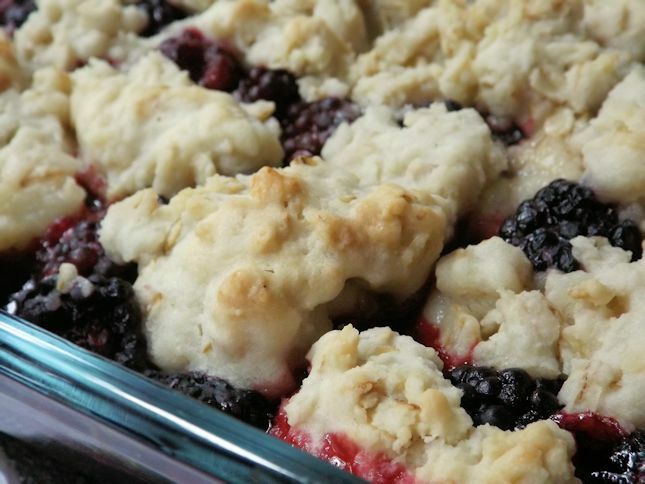 This is the cobbler prior to baking. Excellent results! This recipe is a keeper! It should be gluten-free if the oats are gluten-free. Some oats are processed on machinery that processes gluten grains.